The new Color Of Fun Release from Simon Says Stamp is now live and it is gorgeous! 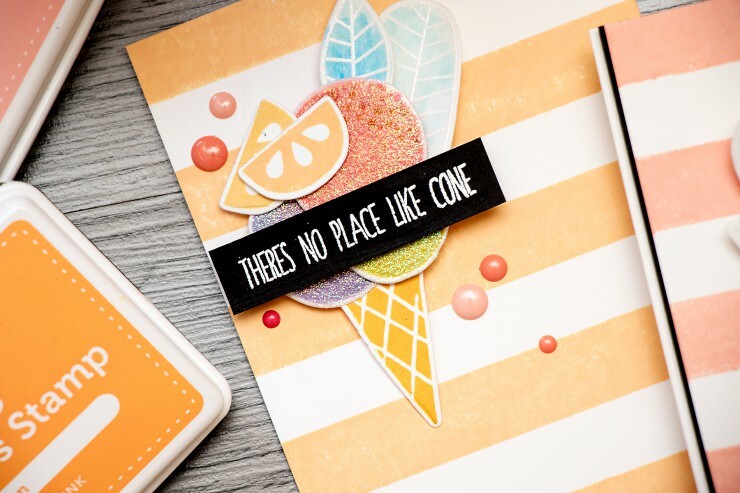 Perfect yummy colors of ink, fun juicy images, lots of cool sentiments – all you need for a hot and sunny summer! 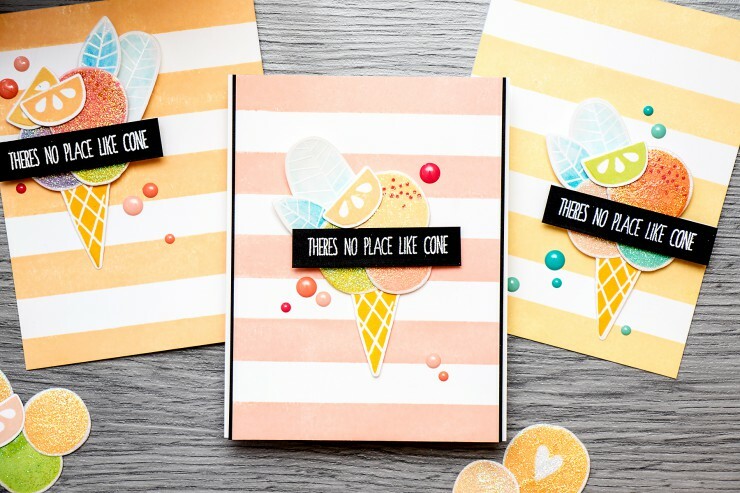 I used Cone Building stamp and die sets as well as One With Nature stamp and dies. I stamped a bunch of ice cream cones and scoops in various light colors of ink from from Simon. I wanted to have several options for my project so I stamped at least 4-5 of each all in different colors of ink. I also added trees to my ice cream to fake some waffles. I know, sounds weird, but I think those worked perfectly for my project. I had them water colored using Faber Castell Art Grip Aquarelle pencils (I’ve shared that technique a few days on on a different video I did for Altenew, you can check that blog post and video here). 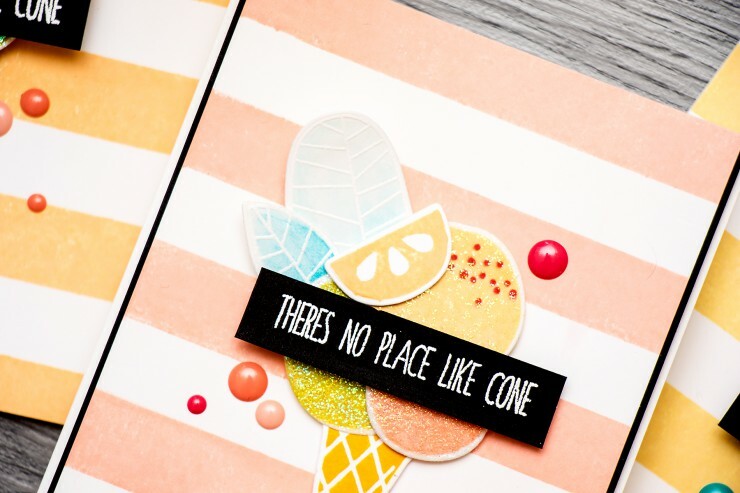 I covered all of my ice cream scoops in glittery embossing powder to create a sugary effect. This is a fun and easy trick to use that doesn’t require too much time or effort. 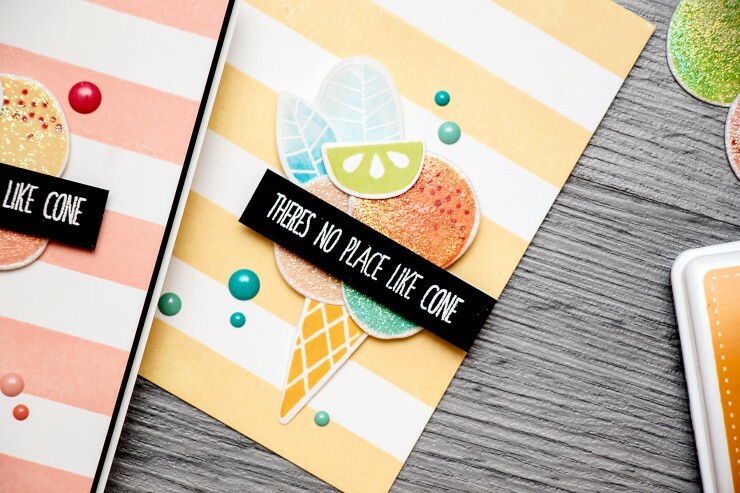 I heat embossed a There’s No Place Like Cone sentiment in white embossing powder onto black cardstock as I needed to create some contrast for my card. The backgrounds for these cards were kept very basic – I stamped a Wide Stripe horizontal background in a few colors of ink from Simon. To complete the look I added a few colorful enamel dots and that was it! Just awesome! Very curious how you did the ‘sugar’. I don’t have time for the video right now but I will dive in to it this evening, looking forward!! I love the idea of adding shimmer to give them a sugar coated look! it really brings out the beauty in these new inks! Really excited for more videos from you. You are so creative! These look like they would be good flavours to try if they were real ice cream! Thanks. haha, I bet they would 🙂 Thank you, Brenda! Awesome video, thank you so much for sharing! Love these new releases. your creations do look so yummy!! great cards! These are so so pretty, Yana. So fun, Yana! Love seeing your creative process! This time Simon killed me! So many new inks! And all are so awesome!! I’m crying!! Yana, your cards are very beautiful (as usual) and refreshing! thank you, Svitlana! Yes, new inks are yummy and very unique in colors. I haven’t had colors like that in my stash. thanks! yay! thank you so much, Lindy!